Following the success of the HX-20, Epson launced a machine geared more to administrative use, being the PX-8. CP/M based, and could use option ROM's as read only disks. The MicroPro package comtained ROM's for Portable WordStar, Portable Calc and Portable Scheduler. The default ROM's were CP/M utiities and BASIC. 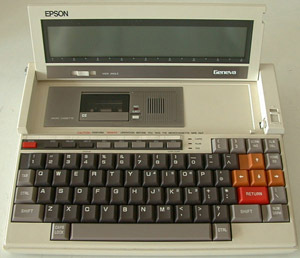 It was not uncommon for a company to use PX-8 machines with custom ROM's with specialized software. 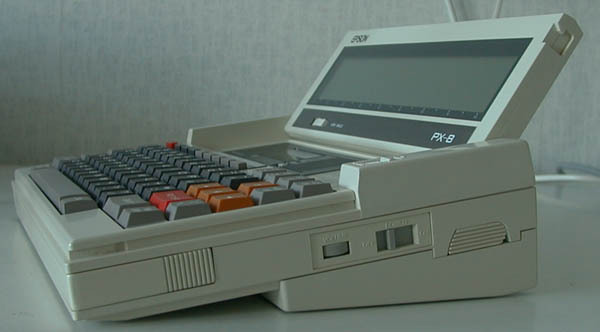 The PX-8 uses microcassette as additional storage medium. Note there are two types of microcassette: Japanese and Philips. here for examples of both. with setting the DATE$ variable in BASIC. With the old OS ROM, only the last option allowed years between 00-76. With the new ROM the INITIALIZATION RESET also allows it. The CONFIG.COM, being in the UTIL ROM, still has the check. An image of both ROMs can be found here. In the Operating System Reference Manual, chapter 3, is some more info on the various reset options. Semi-side The PX-8 uses CP/M 2.2 as operating system. As this is located in ROM instead of floppy disk, and there is no phyisical disk, several things are organised differently from a standard CP/M system, making best use of available resources. The OS-ROM is 32 kByte, located at the lower half of the memory space. This ROM can be mapped out, replacing it with RAM. The upper half is always RAM. During operation, while at the command prompt, the CCP is loaded and running in the upper memory bank. Of both the BDOS and BIOS, only a 'entry portion' is present in memory. These 'entry portions' are in a relocatable format, as their location can change when the RAM disk and/or User BIOS is resized. These events always require a cold restart. When of either BDOS or BIOS a function is called, the lower bank RAM is replaced by the ROM and the code is executed from there. The ROM capsules, being B: and C: drive not memory mapped but are accessed via the 6303 coprocessor, just like the serial port disk drives D:, E:, F: and G:. 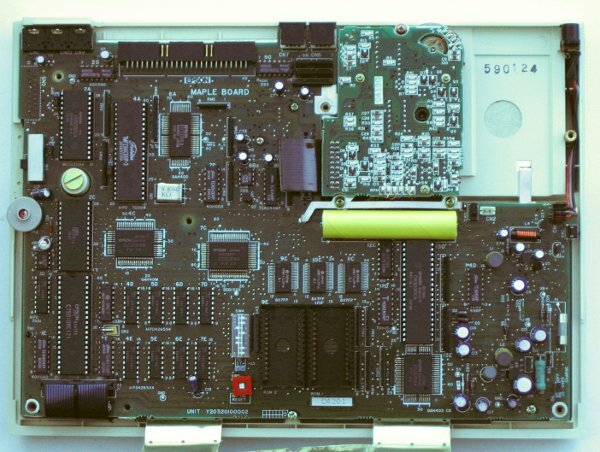 Background info: Disassembly of the OS ROM (M25030CA), Image of the MAPLE board. Side There are several ways to exchange files between the PX-8 and the PC-world. The most obvious is FILINK. FILINK is present on the PX-8 in the UTIL ROM, and obtainable via the Epson FTP site for the PC. Apart from that you need a RS232c cable like the #724 (see manual, Chapter 4). Here is some more info on the FILINK connection. Another option is PXVFS, the PF-10 emulator in MSDOS or OS/2 written by Will Rose. For Linux users there is vfloppy written by Justin Mitchell and friends. The upper picture shows just the PX-8, the lower one has the "Intelligent RAM disk" attached. This means a fixed size 120 kByte RAM Disk as drive A:. There is another memory interface which can contain PROMS similar to the B: and C: drive, but bigger. I have never seen one, but the PROM creation software supports it. Battery pack: 4.8 V / 1100 mAh NiCd Careful with replacement! 4 * Sanyo Cadnica N-1300-SC are batteries of a size equal to the original. "SC" stands for Sub-C, a more ore less standard cell size. A cheaper alternative are four AA sized Ni-MH cells. The capacity can be similar or greater than the original sub-C cells. 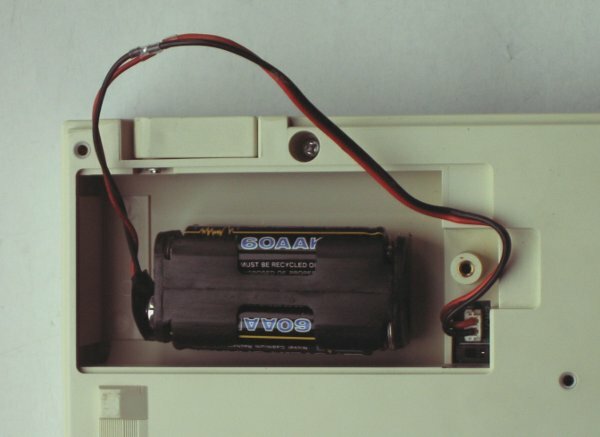 A disadvantage is the pack wil not fit the original battery bay. A preliminary picture of the intelligent RAM disk board. The name is correct. It isn't just RAM and some bank switching logic, but a complete Z80 processor system. This is the first battery backupped dynamic RAM application I've encountered! At this page is a description of a 512 kByte RAM disk and parallel port for the PX-8. The RAM is made available as drive A: and I:, 256 kByte each maximum. An patched operating system ROM is included. The quality of the schema is quite poor, but the structure simple. 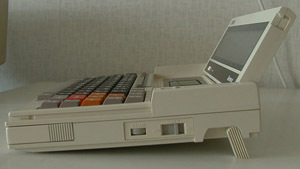 PF-10 A picture or the rare PF-10, the portable PX-8 disk drive. You can turn your PC into several virtual PF-10's with PX8VFS! Print out this picture and attach it to the screen, and it feels almost the same as a real PF-10 :-). The PF-10 uses 40 tracks (67.5 tpi) on each side of the disk, while the standard is 80 tracks (135 tpi). 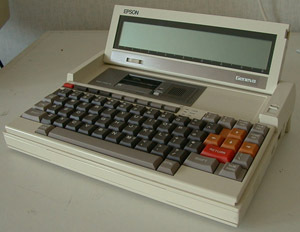 The logical format (location of the directory) is similar to the QX-10 and TF-20. The actual sector size is 512 bytes (TF-20 & QX-10 use 256 byte sectors). 22disk should be configured to use two steps for each track. The directory uses the first 4 sectors of track 4. Track 0 to 3 are reserved for system files and not used by PX-8 CP/M. The data is stored at the remainder of track 4 and track 5 to 38. Track 39 is not used. 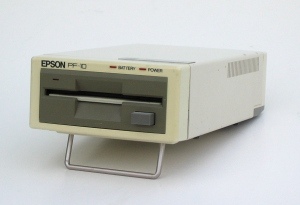 22Disk 1.44 has a definition 'EPS3 Epson PX-8 DSDD 3.5"' which should work. The virtual libary (see below) contains a scan of the PF-10 manual from which this information is derived. The PX-8 has drive B: and C: implemented as EPROM sockets, so PROMs are solid state disks. On the Making PROMs page I collected some info on how to make them yourself. User manual in HTML (partially). Actually this grows on demand :-). BASIC quick reference guide in PDF format thanks to Omer Ekmescic! PF-10 Portable floppy Unit Some technical information. Vfloppy A serial floppy drive emulation for Linux/Unix. ADCLOG - A simple utility for measurement and logging of analog values with the PX-8 wake function. Quick Reference Guide for an as yet unknown device control program. Found it inside a PX-8 keyboard cover. How CP/M is implemented on the PX-8 in the HTML version if chapter 3 of the Operating System Reference Manual. T2d for unix including two TF-20 disks in d88 format (experimental). px-8 parts of the cerealport.homeip.net site. Annotated archive from oldcomputers.dyndns.org/.../ps8/tools This set of files originates from http://cerealport.homeip.net/cereal/px8/. Annotated archive from oldcomputers.dyndns.org/.../ps8/pxdock This set of files originates from http://cerealport.homeip.net/cereal/pxdock/. Battery replacement originates from http://cerealport.homeip.net/cereal/px8/. This is ASCII, not a Word document.